Another 52 Weeks #2: Shows, Cleaning, and what is to come. Greetings all well as promised last week here I go again. 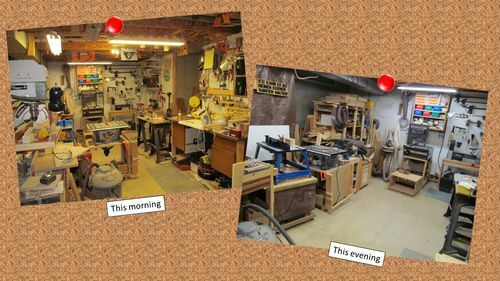 Another year of blogging about time in the shop and other wood related items. My daughter is now 8 and still spends time with me in the shop and is looking forward to being a part of this as well. In the meantime though lets get started. I attended the Woodworking Show this weekend in Baltimore, a few good seminars, some great shopping and even better time hanging out with LumberJocks and plenty of other woodworkers. Besides some new knowledge I also came away with a fair amount of stuff. The highlight is the Juice Proof Vacuum set up which is going to allow me to stabilize my own pen blanks. I am looking forward to putting this to use and will certainly be including my adventures with it here sometime in the next couple of months. Still need to get the vacuum pump. 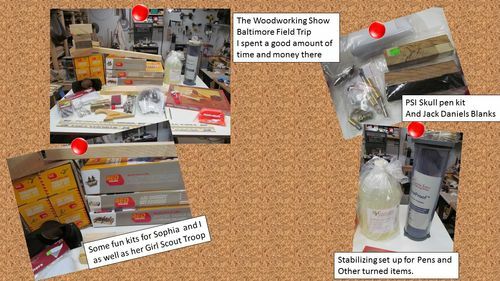 The kits you see will be a a lot of fun with Sophia and the 6 treasure chest kits will be for her Girl Scout group to do as a project. Also bought an intarsia kit for me to try out. After spending two days at the show I decided today to get a fresh start in the shop. So I spent the day cleaning up the shop vacuuming out some of the tools and getting things in order. Now it is ready for me to start in on some fun projects for the next month before turning my attention to Portable Pastimes inventory builds. I am in need of one more bookshelf/table for my office as well as a large corner wall shelf which will go above me electric fire place and provide a space to hold some of the projects I have made as well as those I have gotten from others. I have some ideas and it will be a simple build to match my Dimensional Furniture. The book case is going to be made out of reclaimed wood. I have already started pulling the screws out of it. Going forward I think I am going to be shooting for the 2nd weekend of each month to be about projects Sophia are working on or have worked on. The 3rd weekend is going to be out the business as come May that is when we will be out at the craft market. So perhaps I will touch on some of the Etsy stuff or getting stuff together for the market including displays and such. Let me know if there are questions about any of these things or something particular you would like to see me discuss. I am looking forward to this year and any interaction is great. Look forward to hearing from you and have a great week in and out of the Shop. Well good luck on the market thing! Keep up the information! We do appreciate it. I am sure I am like the rest here; and read a lot more than I comment on. I have tried craft shows, consignment, and even vendoring. I seem to ds as well just from a garage sale as from any of those. Great seeing you again, sounds like you picked up the vacuum canister, should open up a few more opportunities. I did install the remote on the dust collector and am working out the piping, all good. Of course, I am missing a few connectors again, just keeps changing. hopefully you’ll have photos you can click on to enlarge,this site make photos so small aging eyes have a hard time seeing what we’re looking at. Ralbuck- We sold last year at the market and it went pretty well. I will keep you posted though. John- I t was good to catch up to you as well, hope you were able to make it back out in Sunday. daddywoofdog- I will see what I can do. Perhaps I will post them something like flickr in the future.